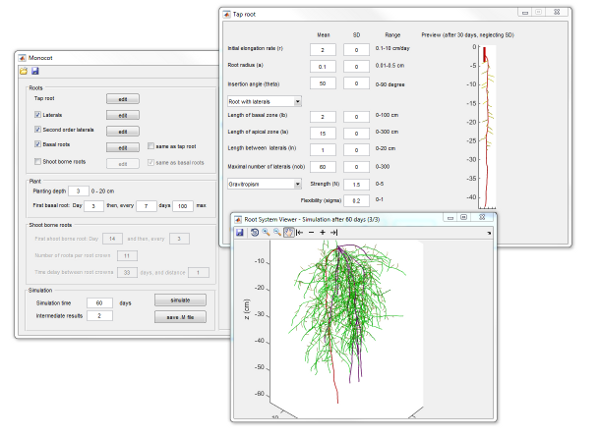 RootBox is developed by Daniel Leitner and Andrea Schnepf and provides Matlab tools to easily create time dependent branched geometries of growing plant root systems. The resulting root systems can be coupled to arbitrary soil models such as nutrient and water uptake models. Time dependent branched geometries are created from user supplied root parameters. Mechanisms included: root turnover, spatial boundaries, root tropsim, and coupling to arbitrary soil models. Auxiliary Matlab functions to analyse results. It is now easier to create root archtiecture models using the new GUI. For a quick introduction refer to this quick guide. The corresponding publication is currently under review. Older versions are available at www.boku.ac.at/marhizo. Leitner, D., Klepsch, S., Bodner, G., & Schnepf, A. (2010). A dynamic root system growth model based on L-systems. Plant and Soil, 332(1), 177-192. Leitner, D., Klepsch, S., Knieß, A., & Schnepf, A. (2010). 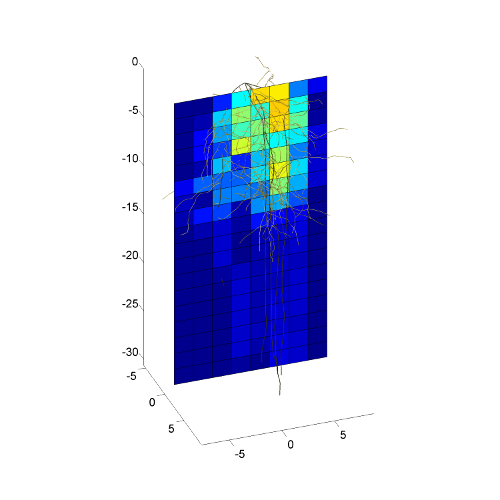 The algorithmic beauty of plant roots - an L-system model for dynamic root growth simulation. Mathematical and Computer Modelling of Dynamical Systems, 16(6), 575-587. Leitner, D., Schnepf, A., Klepsch, S., & Roose, T. (2010). 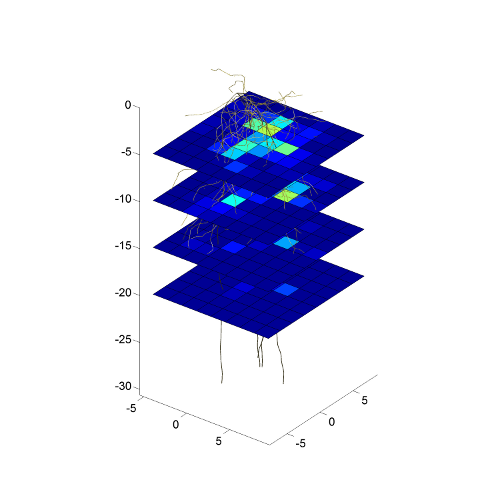 Comparison of nutrient uptake between three-dimensional simulation and an averaged root system model. Plant Biosystems, 144(2), 443-447. Dunbabin, V. M., Postma, J. A., Schnepf, A., Pagès, L., Javaux, M., Wu, L., . . . Diggle, A. J. (2013). Modelling root-soil interactions using three-dimensional models of root growth, architecture and function. Plant and Soil, 1-32. L. Kutschera: Wurzelatlas mitteleuropäischer Ackerunkräuter und Kulturpflanzen. DLG-Verlag Frankfurt am Main 1960.